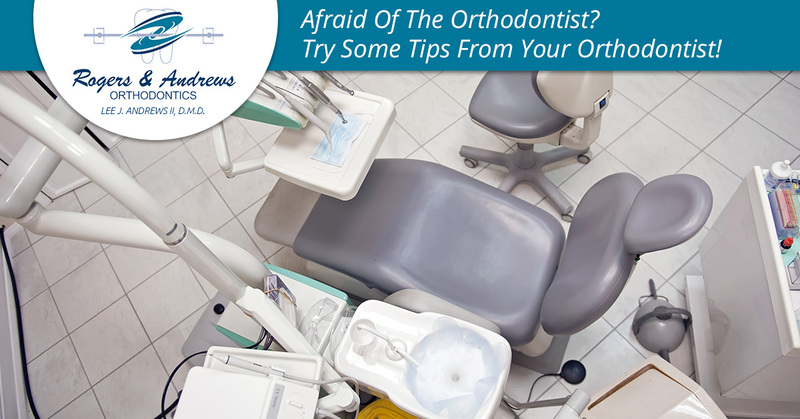 Afraid Of The Orthodontist? Try Some Tips From Your Thomson Orthodontist! Whether you are a child or an adult, getting braces, or orthodontic treatment in general, can be something of a stressful business. It seems that, in reality, like many things the anticipation of going to the orthodontist is often worse than the actual experience. In our line of work it’s not uncommon to hear about dental phobias that people have developed, where they find it extremely challenging to receive treatment from both dentists and orthodontists. This fear often stems from real-life experiences when they had been mistreated in some way. Yet others can get anxious without ever having had anything that resembles a traumatic experience — nevertheless they shudder at the thought of going to their local Thomson orthodontist, or whatever the case may be. Rogers & Andrews Orthodontics is one of the top local orthodontic care providers in Thomson, Augusta, and the CSRA. We are writing today’s post not to announce to our readers that we’ve developed a supernatural, non-invasive cure for anyone who gets fearful about going to the orthodontist, and for that we apologize, seeing as how that would be pretty neat. But alas, we are only human, and orthodontic treatment is inescapably invasive on some level — but it doesn’t have to be emotionally or physically painful for our patients. At Rogers & Andrews Orthodontics, we want every person who walks through our doors to be thrilled about their teeth, first and foremost, but we also do everything in our power to make sure you have a pleasant and calming experience when receiving treatment. Hence, today’s post concerns orthodontic phobia, as it were, where we will briefly highlight how common of an issue it is, before we offer up a few practical tips for the next time you come and see the best orthodontist in Thomson! Hint: that’s us! Read on if you or someone you know could use a few simple techniques for dealing with the stress and fear that sometimes comes with going to the orthodontist! If you experience fear of going to the orthodontist (or dentist) on some level, you are not alone. According to the Journal of the American Dental Association, some 28 percent of people had some kind of dental fear, with over 36 percent of respondents had not been to the dentist in over a year! In the same way, odontophobia can be a serious issue if severe anxiety keeps you from scheduling an appointment for the orthodontic treatment that you need. What Makes Folks Afraid Of The Orthodontist? Don’t be afraid to bring a friend with you for emotional support. We recommend choosing a friend who you know well and can easily calm you down. At Rogers & Andrews Orthodontics, you are more than welcome to bring a friend or family member along to help alleviate any nerves you might have. Don’t hesitate to tell us about the emotions you are experiencing! For one thing, the very act of verbalizing your fear is a sort of tonic in its own right, but it also helps us understand how we can best provide care for you. We are dedicated to making sure your experience is as calming as possible. Take a deep breath. Then take another. Keep doing it. It might sound a bit silly or simplistic, but it does physically calm you. If you have any other personal relaxation techniques you use, don’t hesitate to use them! We hope you can give us the opportunity to show you how much we care at Rogers & Andrews Orthodontics. Contact your Thomson orthodontist to schedule your appointment today!